We have exactly one month left to go before The Hunger Games: Mockingjay Part 2 brings this exciting series to a close on the big screen. While we've already gotten the final trailer from Lionsgate, the studio has released two thrilling new TV spots. The first prepares a small town girl from District 12 for the greatest challenge of her life. The second TV spot tells the story of Katniss Everdeen, an invincible young woman who has captivated the world! The supporting cast includes the late Philip Seymour Hoffman (Plutarch Heavensbee) in his final role, Julianne Moore (Alma Coin), Natalie Dormer (Cressid), Stef Dawson (Annie Cresta), Evan Ross (Messalla), Patina Miller (Commmander Paylor), Robert Knepper (Antonius), Elizabeth Banks (Effie Trinket), Willow Shields (Primrose Everdeen) Woody Harrelson (Haymitch Abernathy), Jeffrey Wright (Beetee), Stanley Tucci (Caesar Flickerman), Mahershala Ali (Boggs), Wes Chatham (Castor) and Elden Henson (Pollux). The franchise finale will also feature a few new characters including Gwendoline Christie's Commander Lyme and Eugenie Bondurant as Tigris. Francis Lawrence, who directed The Hunger Games: Catching Fire and The Hunger Games: Mockingjay Part 1, is directing from a script by Danny Strong (Lee Daniels' the Butler) and Peter Craig (The Town). This highly-anticipated sequel brings an end to this franchise, based on Suzanne Collins' novels, but there has already been talk of Lioinsgate extending this lucrative saga in some way, after Mockingjay. The studio is reportedly developing prequel and sequel ideas, but nothing has been officially announced yet. The Hunger Games: Mockingjay Part 2 will face The Night Before starring Seth Rogen, Joseph Gordon-Levitt and Anthony Mackie, and STX Entertainment's Secret in Their Eyes on November 20. Last year, The Hunger Games: Mockingjay Part 1 was the second highest-grossing movie of the year behind American Sniper, but this year, The Hunger Games: Mockingjay Part 2 will have to out-gross Jurassic World's $650 million domestic take. 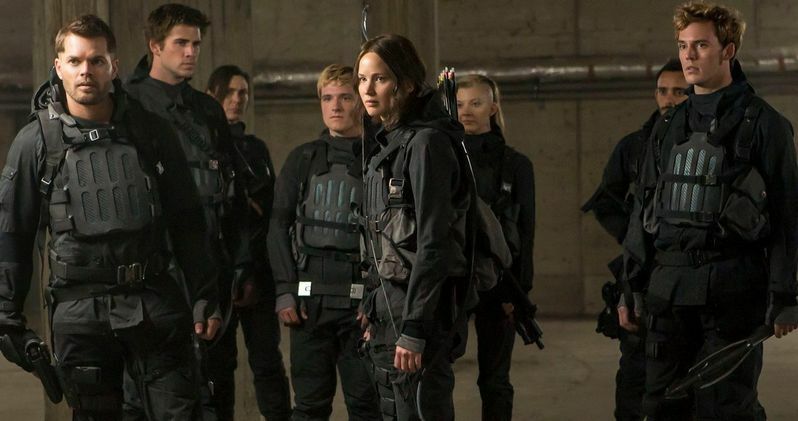 Take a look at the latest footage, and prepare to say good-bye to Katniss forever this fall.